Over the years, Adobe Photoshop has become the go-to photo and design application for many editors, yet others simply never warmed to it. Naturally there is an interest in alternative solutions and one of those is Pixelmator. The company was an early adopter of selling through the Mac App Store and that move quickly vaulted it to the top of the Mac App Store’s sales list, earning it the “Best of Mac App Store” honor in 2011. Recently they released version 2.2 “Blueberry” with a whopping 500,000 updates in one week! Some of that may have been accelerated by the reaction to Adobe’s Cloud-only announcements or by the $15 introductory price. This new version is also a free update through the Mac App Store for existing customers. No matter what the reason, Pixelmator is clearly gaining attention. 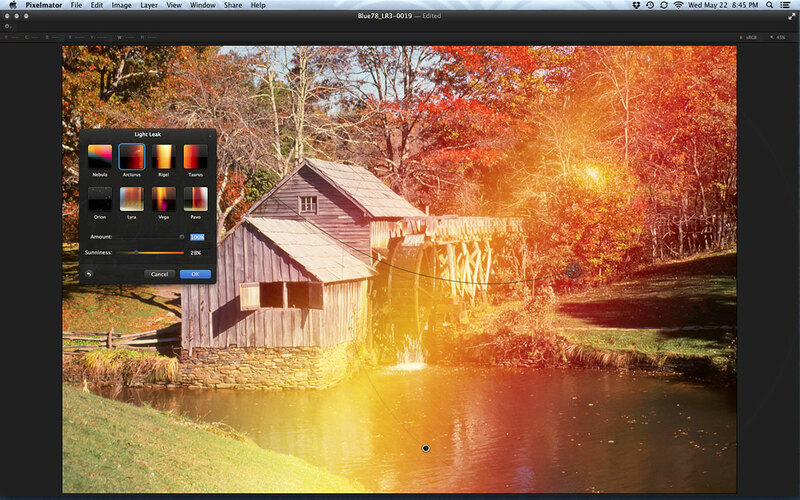 Pixelmator is a paint, design and graphics application built specifically around core OS X technologies. It’s 64-bit and taps into Apple’s Core Image for GPU-based acceleration. By building upon the OS technology itself, the Pixelmator team has been able to develop an application that is well-integrated and can be sold at a far lower cost than would otherwise be the case. The application is new, streamlined and clearly fits into the same interface design aesthetic as Final Cut Pro X or DaVinci Resolve. Previous versions boasted a nice set of paint, effects, retouching and layer tools. Pixelmator 2.2 adds several new shape and vector tools, gradients, shape styles, color popovers and a new light leak effect. If you own FxFactory Pro filters, they also show up as image effects available to be used inside Pixelmator – a serendipitous byproduct of their common use of Core Image. Pixelmator saves files in its own format, but it can open and export a range of standard graphics files, including JPEG, PNG, TIFF, PDF and layered Photoshop file formats. If your main interest is in software that lets you do sophisticated and artistic design and image manipulation, then Pixelmator more than fits the bill. The real question is whether it’s a viable substitute for Photoshop. That answer depends on how much of a Photoshop “power user” you are, plus how much compatibility you need to maintain with clients that supply Photoshop files to you. The most recent version of Adobe Photoshop Extended is a behemoth application in the best sense. It can do video, a certain level of 3D and it has an advanced system of layer styles and effects. Most of these cannot be done with Pixelmator, but then most casual users also never use such functions. If the most you do is apply some basic layer styles to text or a logo, like adding a drop shadow, then you can get the same look in Pixelmator, but via a different route. 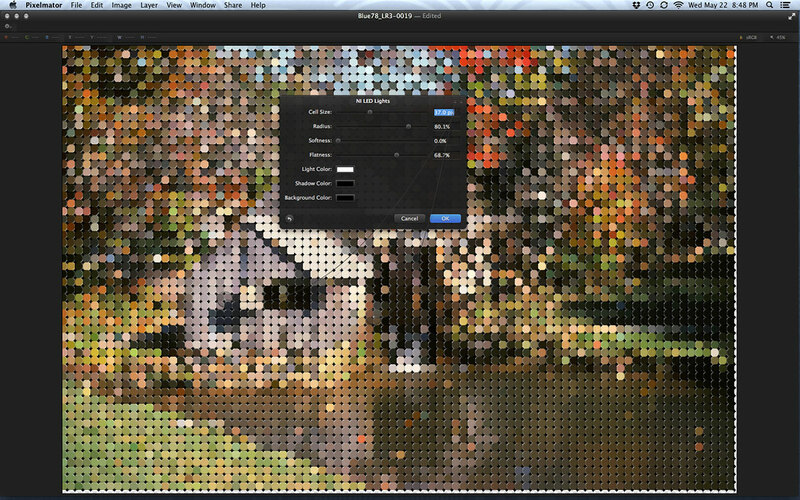 Think of Pixelmator’s capabilities as a very modern version of Photoshop’s feature set around the time of Photoshop 4.0. There were no layer styles, but you could duplicate, darken and blur a layer to create a drop shadow. 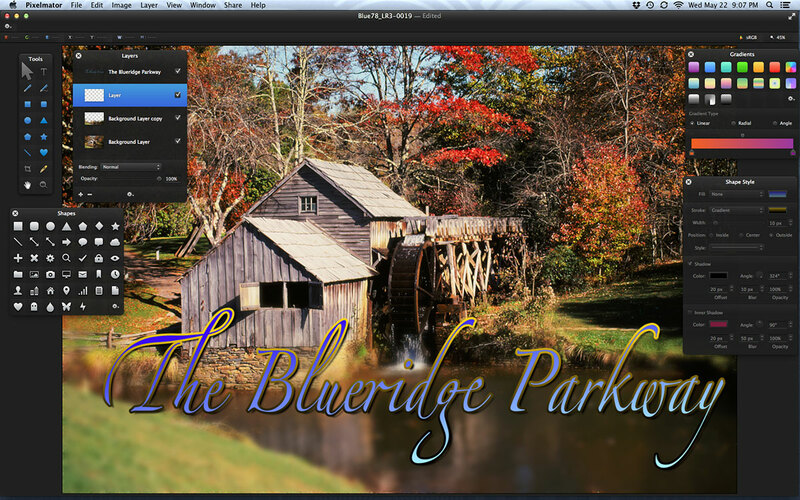 You’d approach it in a similar fashion with Pixelmator, but even better is the new ability to change text into a shape. Once you’ve done that, shape styles can be applied. This lets you fill text with color or gradients, stroke an outline and add shadows – all while still in a vector mode. The keyboard shortcut of command-shift-V switches you into the Vectormator mode. This changes the interface configuration to bring forward all of the vector-based shape, text and drawing tools. Effectively this gives you a mini-equivalent of Adobe Illustrator right inside of Pixelmator. I tested compatibly in both directions between Pixelmator 2.2 and Photoshop CS6. It was actually much better than expected. Layers came across in both directions. Layer effects applied in Photoshop were there, but not with the right look, unless I merged the layer in Photoshop. For example, a drop shadow would be there, but an elaborate emboss treatment I applied was not read by Pixelemator. On the plus side, the vector font was brought in as separate clean layer. Pixelmator files with shape styles applied to text layers – that were exported as Photoshop files – opened more or less correctly in Photoshop. The bottom line is that there is a reasonable level of interchange between Photoshop and Pixelmator, as long as you merge or flatten any layers with layer effects. Pixelmator is a fun application to use. The 2.2 version has some great features and delivers high-quality final results. Excluding DaVinci Resolve Lite (for free), Pixelmator has to be the best bang-for-the-buck of any content creation software. Regardless of whether you use Photoshop a lot or not, Pixelmator is a good addition to the toolkit. The more you use it, the more you’ll find it your new go-to design application. This entry was posted in apps-gear-filters and tagged Adobe, graphics.